This is classed as a pre-workout that contains no caffeine. It is designed to be used to maximize physical performance without the aid of caffeine or other neuro-stimulants. It works by increasing oxygen and nutrient delivery to muscles to assist in increasing stamina and physical energy output, forcing the consumer to go beyond their physical limits. Prototype 8 is a localised, transdermal and vasodilating serum formulated to deliver phytoecdysteroids into tissues to enrich recovery, healing and muscle hypertrophy. This formula was designed to enhance the appearance of muscles and is appropriate for use before, during or after training. This serum needs to be integrated into training a certain way to maximise the benefits. Prototype 8 reaches its optimal effect when the muscles are already sufficiently warmed up and blood circulation has increased. Prototype 8 induces vasodilation when applied directly to the target muscles and allows you to feel the burn within seconds as blood circulates to the area. Thermogenesis is then induced in the subcutaneous and intramuscular fat. The muscles then become engorged with blood within 1 or 2 sets. This holds nutrients and the prototype ingredients in the target zone which then induces protein synthesis, decreases muscle breakdown and enhances muscle growth. Water, Emulsifying Wax NF, Cyanotis vaga Extract, Rosmarinus officinalis (Rosemary) Oil, Alcohol, Helianthus annuus (Sunflower) Seed Oil, Caprylic/Capric Triglyceride, Ricinus communis (Castor) Seed, Hydrogenated Castor Oil, Copernicia cerifera (Carnauba) Wax, Cera Alba (Beeswax), L-Arginine HCL, Rosa canina (Rosehip) Fruit Oil, Glycerin, Sorbitol, Piper nigrum (Black pepper) Seed Oil, Mentha piperita (Peppermint) Oil, Tocopheryl Acetate, Aloe barbadensis Leaf Juice, Stearic Acid, Xanthan Gum, Sclerotium Gum, Glyceryl Caprylate, Sodium Phytate, Potassium Sorbate, Sodium Benzoate, Benzyl Alcohol. 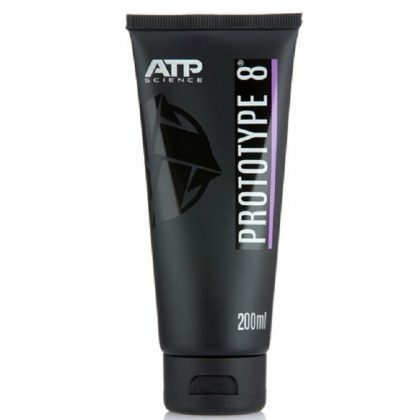 Apply prototype 8 liberally to the target areas to ensure complete coverage of the skin. Massage into target muscle group immediately before, during and/or after exercise. Be sure to keep in a cool dry place and not inside a gym bag in hot car. If this does occur simply place you prototype 8 in the fridge for a couple of hours and the cream should go back to normal consistency.